Summary: Design, Supply and installation of sheet piles, in plain uncoated steel, to form a permanent double storey basement. 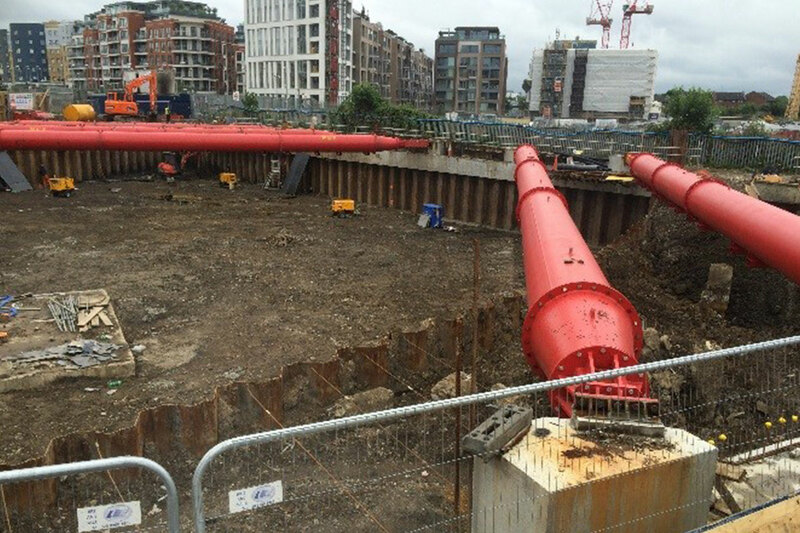 Sheet Piling (UK) Ltd have recently completed the construction of a double storey basement for a new luxury residential development in Chelsea Island. Once completed the development will be mixed used commercial use at ground floor levels with the remaining floors being occupied by 89No. luxury apartments. One elevation was constructed directly adjacent to London Overground line serving Imperial Wharf Railway Station and consequently Network Rail approvals were required. Once elevation was constructed to retain the adjacent Chelsea Island Avenue road and consequently Local Authority Highways Approval was required. The works were located directly opposite the Chelsea Harbour Hotel. There were access restrictions due to weight restriction on the bridge crossing Chelsea Creek. In total 329No. Arcelor Mittal GU section sheet piles were installed to form the permanent double storey basement. 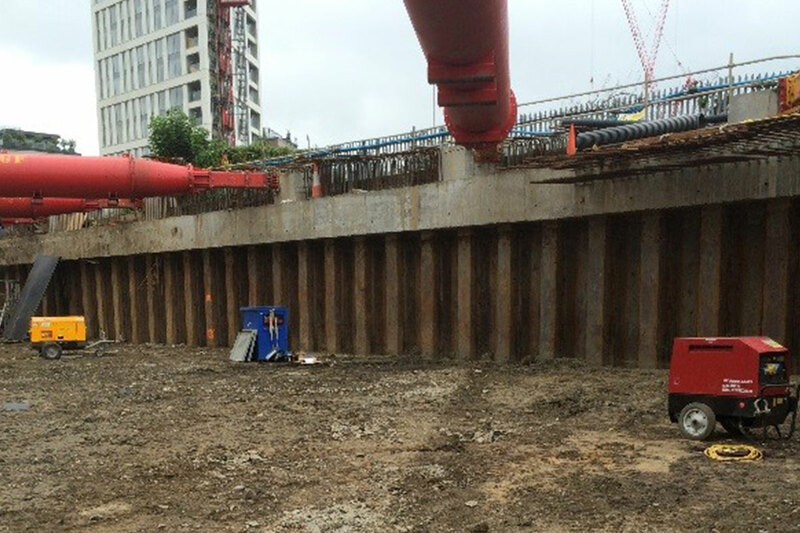 To overcome the restrictions imposed on noise and vibration during the construction works together with ground conditions, the pile line was preaugered prior to sheet pile installation using a Giken Pile Press c/w high pressure water jetting. All plant required to undertake the works was supplied from Sheet Piling (UK) Ltd’s extensive range of modern plant and equipment including ABI Pre-Augering Rigs, Giken F201 Pile Press and Sennebogen Crawler Cranes. Byrne Looby were responsible for the necessary ground movement analysis and ‘Instrumentation & Monitoring’ specification for the works to the London Overground elevation including all necessary Form B and Form C submissions to Network Rail. 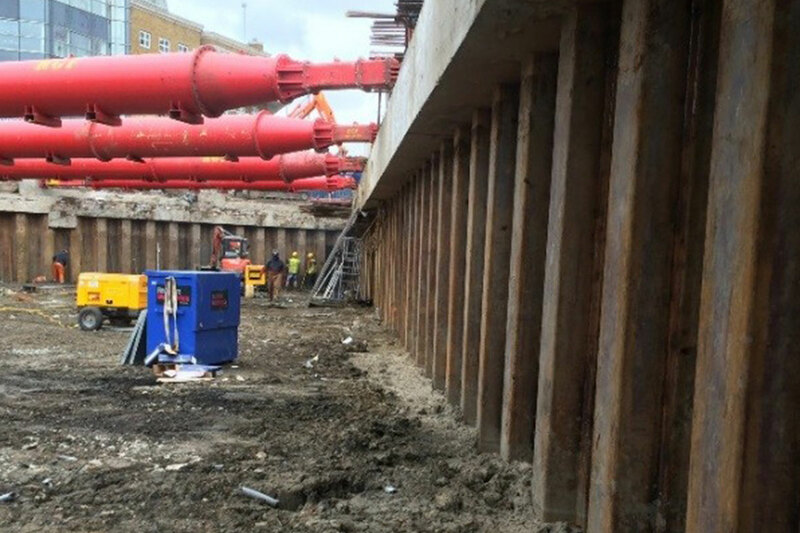 In order to provide stability to the basement during the excavation, MGF were approached to design the temporary works propping arrangement to the basement in order to resist the propping forces provided by Sheet Piling (UK) Ltd whilst ensuring the strict 15mm defletion limit was maintained at all time. In total, MGF provided 16No. 2500Te hydraulic props spanning up to 36.0m horizontally with the props being fixed to specially design reinforced concrete corbels which enabled the ground floor slab to be constructed unhindered around the propping. To complete the works, all exposed interlocks were welded to provide a full warrantied 100% watertight basement wall, as defined in BS8102:Part 2:2009. The works were completed in January 2017 following the delayed removal of UKPN cables which once removed allowed the necessary infill panels to be completed.